MISS PEREGRINE S HOME FOR PECULIAR CHILDREN: A mysterious island. An abandoned orphanage. A strange collection of very curious photographs. It all waits to be discovered in this ground-breaking novel, which mixes fiction and photography in a thrilling new kind of reading experience. As our story opens, a horrific family tragedy sets sixteen-year-old Jacob Portman journeying to a remote island off the coast of Wales, where he discovers the crumbling ruins of Miss Peregrine s Home for Peculiar Children. HOLLOW CITY: September 3, 1940. Ten peculiar children flee an army of deadly monsters. And only one person can help them but she s trapped in the body of a bird. The extraordinary adventure continues as Jacob Portman and his newfound friends journey to London, the peculiar capital of the world. There, they hope to find a cure for their beloved headmistress, Miss Peregrine. But in this war-torn city, hideous surprises lurk around every corner. LIBRARY OF SOULS: A boy, a girl, and a talking dog. They re all that stands between the sinister wights and the future of peculiar children everywhere. Jacob Portman ventures through history one last time to rescue the peculiar children from a heavily guarded fortress. He s joined by girlfriend and firestarter Emma Bloom, canine companion Addison MacHenry, and some very unexpected allies. 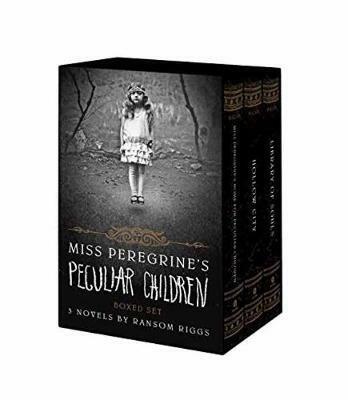 Ransom Riggs is the author of Miss Peregrine s Home for Peculiar Children (Quirk, 2011), a New York Times best seller with more than 5 million copies sold, as well as its best-selling sequels Hollow City (Quirk, 2013) and Library of Souls (Quirk, 2015). He lives in Santa Monica, CA, with his wife.